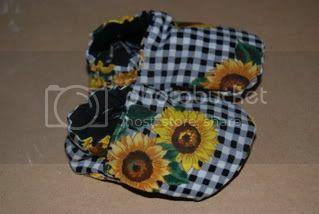 Sunflower Crib Shoes! – Everything Your Mama Made & More! So I have had this pattern forEVER. I actually bought it before you could find it all over the internet. When Zander was little I used it to make him fleece ‘robeez’ style shoes. Well now people have started making them with regular cotton & I have fallen in love with them all over again! So last night I was bored & needed an instant sewing fix. Something that would be done fast for the instant gratification that I love. Anyways I decided to grab some scraps & finally try making a pair for the girls. Thats the down side to sewing for twins, you have to have the drive to make 2 of everything! So I got a few scraps out of the fabric bin & cut out the pattern. They took me about 30 minutes to make frome start (cutting pattern) to finish. I am extremely pleased with them! So pleased that I actually decided to put them as the first item in my etsy store. You gotta start some where right? 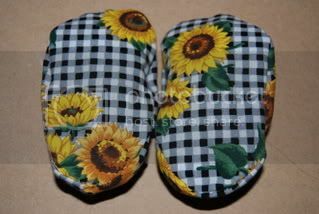 I actually have enough to make another pair, but honestly the girls have NO clothes that match & I don’t have enough of the fabric to make something cute to go with them. In the end though I got that instant gratification that I so desire & maybe I can even make a few bucks off it in the long run. 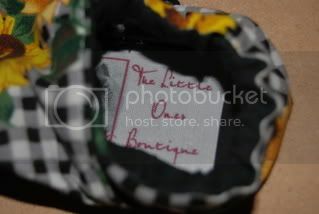 Here’s the finished product, tagged & ready to sale! I was so happy with it that I even put one of my fancy tags in it, something I am proud to have made. 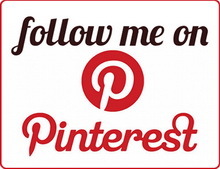 To check out my etsy store click here. Hey Mama.. you did a great job on these.. I have this pattern too and forever keep putting off doing it as it “seems” so difficult,lol. I linked over to your blog through tag surfer, by I am “My3babes” on SM 😉 And you used the same theme on your blog I do, great minds think alike! where did you get the pattern for these? ?